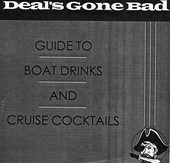 Staying true to the roots, Deal's Gone Bad's Guide To Boat Drinking and Cruise Cocktails may be better suited with a title such as "Guide to the Islands With A Cocktail", or something to that affect. At any rate, they deliver the goods, playing island music as it was in the 60s, uninhibited by modern day influences such as rock 'n' roll, and keeping their traditional sound warm and vibrant. Rich keyboards, a soulful, strong voice, and lightweight rhythms keep things flowing correctly. I'll give it a C+.